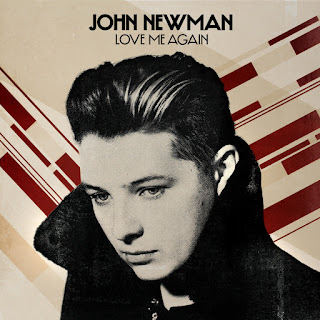 Love Me Again is the debut single from John Newman, best known for his collaboration with Rudimental on their summer anthem Feel The Love. And like that track, this is a real banger. Just as Feel The Love was a dubstep track with a touch of soul, Love Me Again is a soul track with a touch of dubstep. There's an infectious beat and even a breakdown in the middle eight, but the track is driven by the central piano riff tempered with horns and strings. It's all very Rudimental meets 'Strickland Banks' era Plan B. The video, too, has a very Brit gangster feel to it (with a twist at the end) that Ben Drew would be proud of. It's Newman's vocal that's the real talking point though. It's a powerful vocal, full of fire, but with a reedy tone that's something of an acquired taste. Love Me Again is all on one dynamic level - the boy can belt, but there's no room for subtlety here. Expect to hear this track throughout the summer, but whether his voice begins to grate across a whole album remains to be seen. Listen: Love Me Again is released on 1st July.